You are really rockin those peplums! I'm with you on seasonal malaise...we probably have 6-8 weeks left yet of warm to blast-furnace-hot weather. Waaah! I want to wear my sweaters and knee boots again!! I've got a peplum top I wanted to pair with floral trousers too! You've beaten me to it! In fact seeing it on you I've realised I really do like the combination and both colourways look great on you, so I shall have to now take theory into practice and post the results for you to see. That is a fab turquoise statement necklace in the first pic! I love the idea of the peplum with the floral pants. I was like you, only thinking they would go well with a pencil skirt. I like the first look the best. I love the peplum with the pants Jan, it looks great! I am sorry you are hating the heat right now. I feel ya, we even have the humidity in AZ right now to go along with the scorching temps. I'm in love with the floral pant! I like both these tops with the printed pant. It's interesting by shifting the colors in the top and hey a new outfit! Must say my dear, those shoes.......so very stylish. They are going to look great with many options. The blue compliments your hair so beautifully. This week has been so hot here in MN. Overall the summer has been cool. I'm wanting to wear fall clothes too but I've got many months of winter to come. Hope it cools down for you soon. Hi, Jan. So sorry to hear you have the summertime blues. Our summers are mild, so I'm already feeling the dread of losing ours. I could live with summer and sunshine all year round. Of course, I'm not in unbearable heat though either. I especially absolutely LOVE that top outfit with the black peplum. Love every peice to that outfit and the combination of items...especially the addition of that gorgeous color in the necklace against the black. Sooo pretty. Great combinations and shapes! Sometimes it's a simple thing, like trying pants instead of that pencil skirt, that can make a big change. I know what you mean about summer - I hate to see the end to the sun, but I'm a little tired of stickiness. Or is it worth it to be able to wear sandals and shorts? The floral pants are terrific! I like how you've created a new look for your peplum tops by pairing them with pants. I prefer peplum with pencil skirts too but have paired them with a fuller skirt and was very happy with how much more feminine the look became. Both outfits are great and love how the blue pops against the black top and how it picks up the blues in the 2nd photo. I am also looking forward to autumn, my favourite season. Loving your flowers, and your lovely comments. Though I am not a big fan of extreme heat but still I am a summer-person. I would not mind to have summer all year around. Interesting combination of the peplum tops with your floral pants. Looks chic and so summery. Yep, this is definitely one of my favorites on you. The peplum with floral combines two trends perfectly. You look really good in turquoise, it suits your coloring really well! Hi Jan. These peplum tops looks terrific with your floral pants. The black combination looks very very sophisticated and elegant. And I do love the turquoise necklace. And the second one looks chic and fresh and cheery. Both outfits are perfect. Love your shoes. Even though you're over summer, you look radiant in your peplums with the floral pants. And the addition of neck wear. Peplums have a way of adding a playful touch/silhouette to any ensemble! Your shoes are divine, by the way! Fall is in the air here in Denver, although there will be many hot days to come. But the evenings are already cooler, and layers come out for the evening. New beginnings are just around the corner. 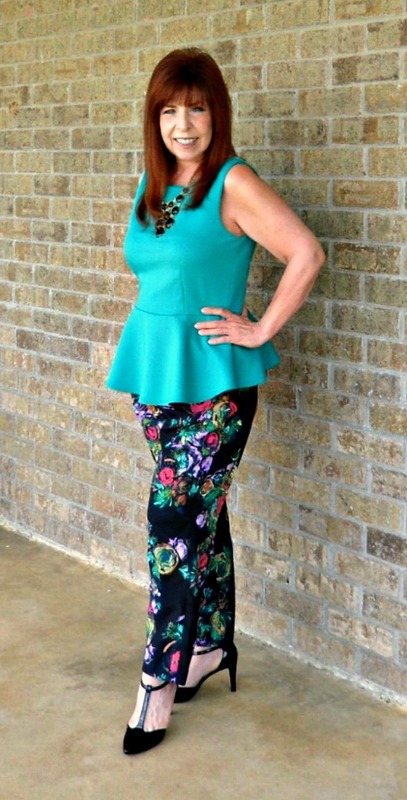 the peplum with the floral pants is super cute--love it with the dressier heels. and i think the aqua one is the winner--that color is fantastic on you!! I've got the blahs, too. fall is my fav time of year!! Funny how we always want the next thing when a season comes to an end. There is no allure for the new like that of the fall clothes season; Perhaps it is the promise of layering after a long, hot summer. Not that I would know. I am the person left enjoying the heat, seeing as though I live in the rain. hey Jan, darling double peplum post. I love summer. I don't want it to end. Just as long as September has warm temps, I'll be fine. But we have has snow in September before so I still have my fingers crossed for a nice September. and ...thank you for your compliments on my post. You look great in peplum shirts. I want to get one now. :) Love these with the printed jeans. Hi Jan, would you be willing to let me know where you purchased your tops from? I love them both and have avoided them, but you make me beleive I could wear one! Your options are fabulous and I especially love the black peplum with your lovely turquoise necklace! The peplum tops with a big old necklace and the funky floral trousers looks like a winning combination to me, Jan! I know what you mean about trying different combinations though - some people seem to mix up their wardrobes into countless combinations, whereas I tend to stick with very samey ones... But I think they work, so I'm sticking with it! Super elegant shoes. Super elegant you! How are you sick of summer? Argh I am so scared of winter. Although I guess I do look forward to fall! Anyways, I hope you manage to enjoy the last few weeks because you'll be sick of winter soon enough I'm sure! Glad you like them! So much of the time, I feel goofy in brights. One of the pitfalls of our local lack of shopping. They really want to step out in these super-warm temps, and I fall for the blandishments of saturated color. My heart is in dark neutrals and deep, deep and tertiary jewel tones. Looks like the thinking this fall will bring them forward again. Almost followed your lead and bought a black biker-inspired jacket yesterday, but was proud that I held out for better selection. It took all my will power, but I'm holding out for the Philip Lim-Target thing on the 15th. Soon ... soon ... I'm like a kid waiting for Christmas. Thanks for dropping in ... always so nice! Seriously, I'm looking forward to seeing how it should be done. You have such great and specific taste, that I always learn from your posts. I'm just happy you think it's not unthinkable. Glad you liked my turquoise ... it doesn't get out of the box like it deserves to. This fall should hold some opportunities for it! Love it when you can comment, Special fun for me! Jan, I hear you on all levels. I'm kind of, no I'm really super duper tired of the heat and brightness of summer also. Funny how we get this way, isn't it? good thing I live in a 4 season climate (kind of bad on the wardrobe budget) but a great thing for us creative gals who tired easily of the same old, same old, day in and day out. I also hear you with your mixing this summer, I love how you're showing us all these fun options. When you paired the bright blue peplum with those fantastic jeans, wow, it just brought out a whole new pair of pants. By the way, those heels are so dang cute, classy, and sensible (I want some). Thanks so much for stopping by today and for always taking the time to be so personal. I apologize for taking so long to get here this week, I started a DIY project and when I do these I kind of get in a zone. Have the rest of a wonderful week. Wow ... beyond the call of duty for you to drop by, Suzanne ... thank you so much for what had to be some effort. Was just at your site, reading about your recovery. I'm so looking forward to seeing you in health again. Thank you, Adorable Alyssa. I'm not just hating the heat, I'm hating the slow business time of year that this miserable weather promotes, and the early beginning of our slow season. 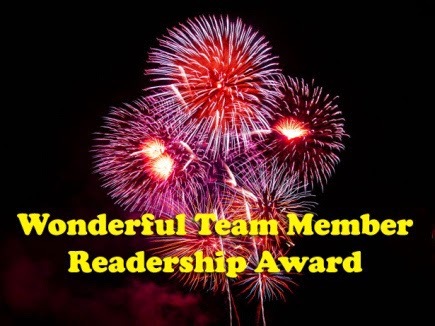 If I didn't have my bloggy buddies like you, I'd have a much drearier late summer. So happy you're back from vacations, mental and physical! Love youse in the blacks and darks ... they feel feisty this time of year, and I can use encouragement to maintain the feisty! Yes, I think about you and the others over in N-Ville. It's not just hot here, it's sullen. And I'm going to need rain soon, so I hope it happens. That will help. The other thing that's depressing about this difficult weather is that I feel guilty for not appreciating it. We've been lucky this year with lower temps, but once it reaches a certain point it's still miserable whether it's just 99 or 109. Thank you for the kind remarks ... the shoes are one of two different pairs of black t-straps for fall ... these in patent and shorter heels. The others with higher heels and half suede. In spite of the sandal-ish feel, I'll wear them this winter, I hope. Have a great long weekend coming up. You know it always makes me happy to hear from you. Well, thank you Glenda. Glad you liked them. Looking forward to what you come up with in the coming weeks! Hello, Blue Hue Beauty! Thank you for your sweet remarks. I'm trying. I'm feeling smug about the two strappy and similar pairs I've shown lately. Part of the problem with our falls and winters here are that they are humid and can be very cold at the same time. I will be grateful for cooler at some point and sooner is better than later! I hope the rest of your summer is as mild as you wish. Mine too, for that matter! Drop by whenever the mood suits! I'm glad that you are relishing your summer! I should behave better about ours ... not really unbearable, but not comfortable. So pleased that you liked the Great Peplum and Pants Experiment. I'll be glad to get away from the gaudy summer palette I fell for this season. I'm loud enough, I think, without a color festival in my wardrobe. Thank you for taking the time to stop by ... 'preciate it! Thanks, Val. Was on the porch last night, and caught the last sniff of honeysuckle on a light breeze ... thought about you! Glad you liked my experiment. I whine about the heat, but it feels churlish considering how much I wanted to see spring. It was a long one this year, so I need to stop kvetching. Gotta say again ... I loved your stripes this week. Way cute. So happy that you could drop in. Always a treat when you do. It's all about the options right now ... it's a penance for my summer shopping spree-let that included some experimental purchases. Glad you liked the result. Always a pleasure when you can comment ... drop by anytime. Thanks, Jean. That's another way to go! I hadn't considered that. You're so smart. I've gotta get my nose back in my closet this week and find some more new combos ... too easy to fall back on the tried and true. But perhaps I should edit the results more thoroughly before I publish! Thank you so much for the kind remarks ... I always look forward to what you have to say and show. You may feel blah but it's the last thing you look!!!! You look amazing. I detest summer....let me say that again...DETEST it. All I want to do is hibernate until Fall. It stays hot here forever, too. I may have to start a series of posts that consist of "what I would wear if it was cooler" outfits, you know? Hello, Sharon. So kind of you! I wish I had a more subtle approach to dressing, but perhaps I can make that side of myself better evident this fall. Thrilled when you stop by ... you're one of the women whose taste I really would like to better emulate! If you say you like it, then I know I've done something right, O Glorious Sacramento. We will all have so much fun this fall, I just know it! Hey there, Olga. You may have all my share of summer for the rest of the year! Thank you for taking the time to stop by for a visit. I always enjoy and look forward to your own posts. You're always welcome here! Thanks, Alison. Glad you like my experiment. I really wanted to try peplums the last couple of seasons, and when they finally arrived here I may have gone overboard a bit. Reassuring that you like them, as your taste is excellent. Always, always tickled when you can stop by! Thank you, Lenya. I thought they looked different enough in feel to show them both. A different attitude with only a color change was what I was going for. I appreciate your notes on it very much. So glad you've started joining us at Patti's Visible Monday. Stop by any time! Just the words I need to hear right now, Judith. Of course I don't just hate the heat, there's a lot going on that's difficult and attendant to the heat as well. There's a lot to be said for living in the moment and not looking too far forward for happiness, But sometimes when the present is difficult, I reserve the right to look forward to better times! So pleased you like my silly peplums ... they are kind of giggly, aren't they? They remind me of the New Look suits my mother and grandmother wore, although they'd be apalled at my interpretation! Kind of you to use the word radiant ... it's just sweat, but I like your idea better! So happy you came by. Always thrilled when you can! Thank you, Anja! I worry that peplums are a little youthful for me, but I've wanted to give them a shot anyway. They do give my short-waist a place to show off, for a change, and trim up my top half. Glad you liked my necklaces ... they're still experimental for me, so I'm glad to get your feedback. Stop in anytime, kiddo! Nice to hear your perspectives. Cooler. That's what I want ... in 'ma style, and in our weather. Instead of the colorful exuberance that I saw in my spring choices, now I'm seeing garish and gaudy. But it will come soon enough, I guess. I need to be in step with summer color no matter what I am longing for in fall. Ohm.... ohm..... be the season .... ohm. Gotta be like the dogs ... sleeping happily through it! Thanks, Tamera. Glad you liked the Great Peplum Experiment. What I do like is when you can drop in. Always a treat. So right. For me, it's always the promise of going back to school. New stuff to think about. If I could, I'd be a student forever. I miss the guaranteed challenge with few penalties for trying without achieving complete success. Peter Pan-Jan.
Hope you have a wonderful end of the season, and that your fall stays warm and summery for a while. And dry when you want it to be. You're always welcome here... like the rain! I miss SoCal and our great weather there! I'm a San Diego county native. Glad you liked my turquoise ... reminds me to drag out my turquoise jewelry more often as well before summer is over! Stop by anytime, Oksana. Always a pleasure to hear from you. Yikes! Snow is good for my pasture but awful for my business. With the strange weather patterns this year here, it could happen. We had sleet in July ... not sure if that's ever happened here before! Enjoy your summer. Would send you the rest of mine if I could. Glad you liked the Great Peplum Experiment! Good to hear from you any time, Renae! Since you have a body built to hang clothes on, I hope you can find one to try! Glad you like my silly peplum experiment. The high plain neck styles might make a nice background for your beautiful necklaces. Love it when you stop by. Oh, easy! I got them in from JCP (really ...) from their Bisou Bisou group. I was there last week, and noticed they still had quite a lot of them in all but the tiniest sizes! And at $10 each, such a deal. Magenta, black, white, turquoise, pink and yellow ... fairly sure they are still on the website, too. Good luck, and I'm so happy you stopped by! So nice of you, Lady of Style. You really are that, and I find your tutorials very helpful and inspiring. Glad you liked them, Annette, and I'm always glad when you can swing by here for a word or two! I forgot, Curtise. I'm sorry. I just checked to make sure I have your addy, and there it is! Will do ASAP. Thanks for liking my Great Peplum Experiment. I'm really confusing myself, and have to watch being too much of an optimist about what actually works and what falls short. First thoughts are probably best ... and at least I've learned that. I like the narrative of these T-strap (two pairs, this week and last week. One suede, the other patent, different height heels.) They are a little shy girl, but with a sharp toe and a pointy disposition. That's me. Missed seeing you this week, with the rest of the usual suspects. Quite a few MIA, and hope everyone is well and just on holiday. Any time, with anything you have to say, I'm glad you came by! Hello Norma! I got them at JCP (Pennys to us old girls), and last I looked they still had some. (Bisou-Bisou for their stores.) $10 bucks. Fly-Over USA, hello! I've wanted to try them for the last couple of years when they finally showed up here in Mid-Nowhere. There had been skimpy junior sizes, but none really optimal for the ... ahem ... mature bustline. Glad you stopped by. Much appreciated and enjoyed! It's too hot and humid to go out without feeling really uncomfortable. The steering wheel in my car gets too hot to hold even with window shades up while it's parked. And my restaurant, even when the AC is on, is much harder to work in. The heat makes people cranky and driving is difficult. AC is a life-saver, but the costs go up with it. That's why I'm sick of summer. I understand why folks are in love with it, but not here. I know that winter has it's difficulties, but at least clothes are more fun, more my taste and style and more flattering generally for my old self. And of course, you are quite right. I will be sick of winter, but I love spring ... best of both worlds! Fall is the real fashion season, when clothing choices become more thoughtful and new ideas are everywhere you look. Just ripe for experimentation. Love it. Thanks for dropping by, Isa. And thanks for asking that question that allowed me to vent just a little more. It helped a lot! Thanks, Kim! You're always so ready with a kind word. I'm so ready for fall that I have my wish list under construction. I keep going back to it, adding and amending. It's my grown-up version of my childhood Letter to Santa. I don't have a summer figure. Tall women have summer figures. I'm all optimistic and stoked in spring, about how I'm going to make light weight clothing work better, but just about now is when I start yearning for the easier dressing of winter. I look taller in winter. I just know it. Not to worry, Trina. I'm catching up, too. I just read your lovely post on how you raised your kids to get out there. Good for you because you are/were a great parent ... but good for you that you know it! Thanks for your so kind words. 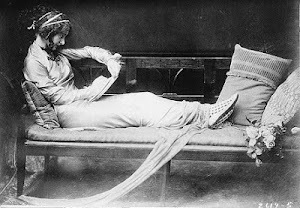 The more I write about summer vs. every other time of the year, the more I'm convinced I am a wintery woman ... I'm always glad for spring, but summer is too hard here. With luck, it will be as mild as last winter. Pop in whenever you can, adorable Trina. Thanks, sweet Jean ... you say the kindest things. If you like what I'm wearing, it's a keeper in my book. Yep ... you know what I mean about humid summers. So glad I'm in good company. Here, everyone goes to the swimmin' holes, fishin' on the river and cooks up tons of barbeque. None of which appeal to me. Some day, Dan and I will actually take a vacation (or retire, whichever comes first) and then I'll find some fun in the summertime. Thanks for listening to me whine! I feel better now. If ever there was a time for big-old-gaudy-turquoise, it's now. I like it best with gold, but it's harder to find and way more expensive! Waiting, with you, for more interesting style weather! So pretty, love your floral pants. I have gotten use to the heat living in FL for over 20 yrs. We have summer almost year round. The summer here was unexpectedly long and hot and I really was longing for cooler nights and days where I can wear more than a super light dress. But now late summer is here and it is colder in the morning I'm longing for warm summer nights and endless sunny days. Seems I always want what I cannot have. Nevertheless I can understand that you are a little bit bored about summer clothes and their options. However you found a very lovely look. 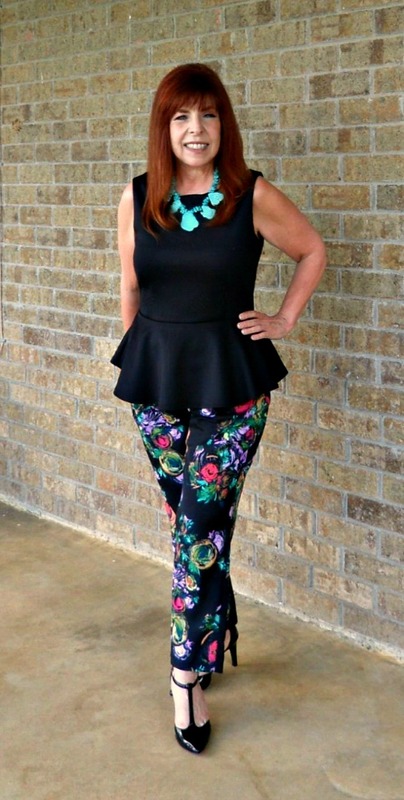 The peplums with this gorgeous floral pants look wonderful. The turquoise looks gorgeous with your hair...and those pants...nice!! I've actually had those tops in my hand the last 2 times I was at JCP, but didn't get them...now I'm regretting my decision! Did you see that they now have them in fall colors with cap sleeves? I love fall, it's my favorite time of year, but the problem with it is winter follows...I detest being buried in snow even more than a billion percent humidity! Hey Jan, hope you are having a good holiday weekend. Say I'm doing a necklace giveaway the next few days and I'd love to include you. I saw Patti is on vacation so missing the Sunday night link up. I could see you wearing this piece so swing by if you have time. Well done. They both look good. When I did the remix I did discover some new and lovely combinations. But I get your remark "wasn't the first option the best". Thanks, Greetja. Not my best effort, but an option. I'm a fan of those! The more the merrier. So glad you came by for a visit ... as always. So true ... I don't wear them much because my hair usually hides them, but since this last weekend's fiascoes that had me chopping off my hair, there's a lot more room to show off necklaces! Glad you like this one. Drop by anytime! My ban only goes so far as summer stuff! Fall is ON like Donkey Kong! Not much in store here, and only have half an idea what I'm going to want, but I do have some replace-worn-items projects like yours. Light weights sweaters, mostly. I'm making a list and shoes always come first! So glad you stopped by, kid! Yup ... I'm with you. I'm so happy to see wintry shapes and colors and textures out there now, finally! My prohibition was on summer-only pieces, and I'm making my list for fall. Don't NEED a lot, but am lusting after a few pieces. I've also got a bad habit of buying too early in the season, 'cause I find more interesting pieces the deeper the season gets! Thanks so much for you sweet remarks, SS! I missed you, Marla! Sorry ... miss your blog too! Thank you, lady. Your taste levels make that an extra nice compliment. Arrrgggh! I missed your note, Sabine. Don't know what's wrong with me! Sorry, 'cause I'm always thrilled when you leave a note. Like you, I'm always looking at the other season ... no matter what one I'm in. I usually manage to be in the moment for a little while, but looking ahead is just another form of planning, yes? So kind of you to like my pants and peplums! Hope your summer is staying nice enough for you to enjoy! Yours is among a pile of notes I completely missed, Debbie ... so sorry, 'cause it's always a treat when you come by for a visit. Nope, haven't seen capped-sleeve peplums there, YET ... they're still clearing out a lot of summer. I'm distressed to see what new things coming in looking pretty dowdy ... not as style forward as what they've had in the past couple of years. We'll see. I was in Alaska for over a decade, and snow never stopped us ... you just put on studded snow tires and go on about your business. Here, everything comes to a screeching halt and my business suffers terribly. No snow, please, this year. Thanks for the shopping tip.